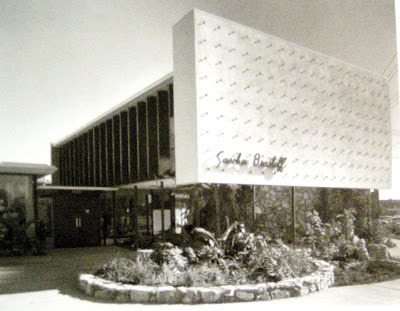 When I was a little girl, my Mother and Grandmother used to take me to the Sascha Brastoff "seconds" store on Olympic Blvd., west of Sepulveda. West L.A. My Grandma Freda was fond of rooster images. She had excellent taste. Sculptor, Sascha Brastoff was also mad about roosters and depicted them often in his artwork. I have written about Sascha's work before. I barely remember the store, but I do remember the outside display area where the seconds were shown. I mentioned this store to my husband, Larry. He said that he had a book about the work of archtect, A. Quincy Jones and he vaguely remembered that Jones had designed the store and there might be a photo of the store in the book. Bingo! The store, ceramics area and outside display space was depicted beautifully, just as I remembered! Today, there are various offices, stores and other industrial buildings on the site. How I wish this one building of mid-20th century design had been preserved. 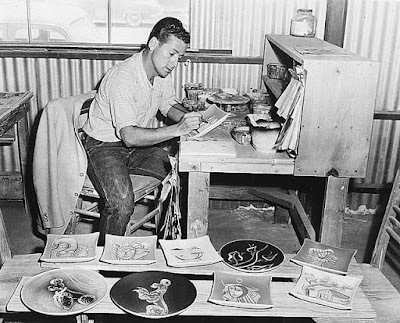 "...In 1948, Sasha Brastoff set up a Quonset hut ceramics plant in West Los Angeles, Sascha Brastoff Product's, Incorporated. Millionaire industrialist, Winthorpe B. Rockefeller, took an avid interest in Sascha's work, serving as a financial backer, and social circle promoter. With Rockefeller's support, Sascha moved into a much larger shop on Compton Avenue in south L.A.
After several expansions, Sascha opened a state of the art factory and studio on W. Olympic Blvd. in West LA in 1953. At the Grand Opening such Hollywood luminaries as Edward G. Robinson, Zsa Zsa Gabor and Mitzi Gaynor made it the party of the year. Sascha counted Joan Crawford, Donna Reed and many other prominent stars as customers. His work commanded high prices for the period. In the mid '50s, Sascha was very busy, designing meal sculptures, producing one of a kind commissioned pieces for Rockefeller and others, as well as design pieces for TV shows. He made public appearances at fine department stores to promote his lines, and appeared on television decorating and talk shows. Sascha even had exposure in the movies; an elaborate metal fish sculpture of his was prominently featured in the Sci-Fi classic, Forbidden Planet. Sascha was Hollywood's darling. 1961 found Sascha renegotiating his "deal" with his company's financial backer, Rockefeller. Sascha demanded a percentage of profits rather than his lucrative salary. At the end of the year, he was presented with a bill for over $10,000, his share of the company's losses. In 1963, under severe pressure, Sascha suffered a nervous breakdown. The previously gregarious Sascha became a recluse, debilitated by his condition and afflicted with agoraphobia. Until 1965, he barely left his Military Avenue house in West L.A.. In 1965, friends convinced Sascha to produce again. The hiatus bred some of his most recognized pieces. It was after 1965 that he produced works of Styrofoam and resin. In 1966, he won a commission to create a 13 foot gold plated cross to adorn the St. Augustine by the Sea Church in Santa Monica, California. The project included four altar candleholders and altar railings. During Sascha's absence, his company reissued some popular designs and registered "Sascha B." as a trademark name. In 1964, the plant moved to Hawthorne, CA in an attempt to reduce overhead. 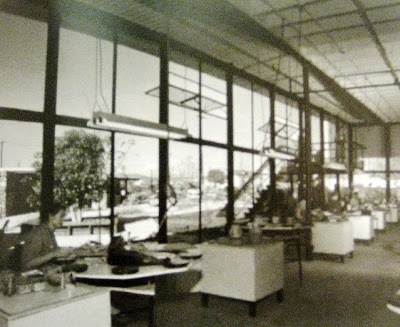 The company continued to produce designs until 1973, when the factory shut down. 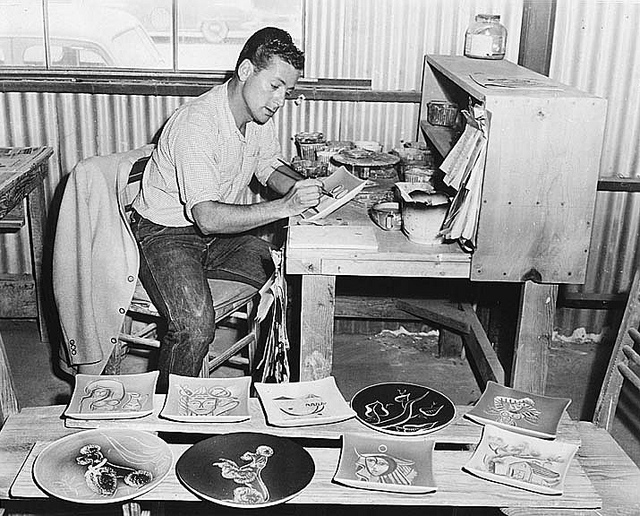 Sascha authorized the sale of his name to a variety of companies, including Royal Haegar to produce ceramics, and Marilyn Watoon to create costume jewelry. Marina Metal Arts and Merle Norman Cosmetics used his designs under an agreement with Sascha. In a 1976 co-venture with the Franklin Mint, Sascha designed a six piece sterling miniature circus. The six piece set featured The Performing Seal, Clown, Butterfly Girl, Ringmaster, and Circus Lion. 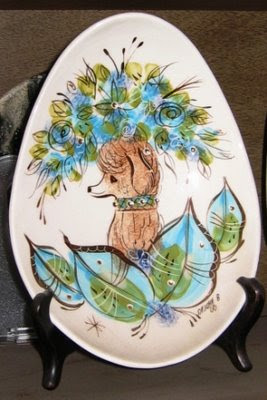 In the late '70s, other manufacturers used Sascha's name, including American Bisque Porcelains, and California Jewelsmiths of Beverly Hills. 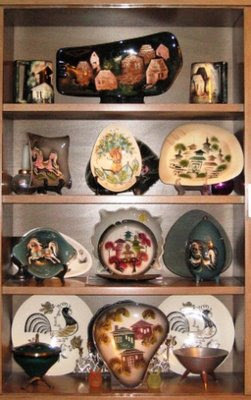 Below are a few ceramic items by Sascha Brastoff that I have collected over the years. Thank you, Sascha B. for continued artistic inspiration!